To Dig or Not to Dig? Answer to a Reader’s Question. A few days ago I got a letter from a friend of ours, a loyal reader of our website. The question was: “Do you always dig your garden? Which side do you take in the debate on whether to dig or not to dig?” The up-to-dateness of the question inspired me to come up with a thorough answer. Here I would like to share with you the essence of our correspondence. So, to dig or not to dig, that is the question. The short answer is that it depends on the locality and circumstances. We should not be attached either to digging or to non-digging, but we have to decide based on the knowledge about the circumstances. To keep it simple let us take an example of a vegetable garden that has not been cultivated for long years. If the garden is clayey and/or stony and is full of scutch of perennial weeds (in Hungary these are hunger-grass or scutch, creeping thistle, bindweed or convulunvus, and Bermuda grass [found in more sandy soil]), then we may dig the garden a couple of times in a year through several years, 10-15-20 cm deep, while at the same time take out stones and scutches, manure it and add compost to it. 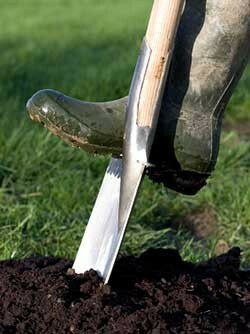 Later when the structure of soil becomes better with fewer weeds in it, then it is enough to dig it once a year. This digging can even be a shallow one, for instance at autumn time we dig in the compost. In a few years time, if we are persistent, then we will have such a weed-free soil in the vegetable patch that is perfect for vegetables. At that time, if we cover, mulch the space between the vegetables and from time to time plant green manure vegetables (mustard, spinach) as well, which we mulch after scything, then practically we do not need to dig the garden at all. If we draw aside the mulch or compost spread on the soil, we will find such friable soil, rich humus, where earthworms play a major role in improving soil fertility. In this case we only have to draw a shallow furrow when sowing. It depends, of course, on the locality, and naturally, the type of land, when do we achieve this ideal condition and how we can maintain it. For example, in our area, in Somogy county, where soil is clayey, we need 4 to 5 years to get to this condition by continuous, elaborate cultivation of the ground. Nonetheless, even if have reached this ideal condition, it is advisable to dig the soil every few years, because it gets quite agminated due to high clay concentration. After such loosening a good vegetable patch can be used for 4 to 5 years without digging it again. However, in our neighbouring village the land is sandy, therefore, one can use the garden there without any digging, but merely cultivating it continuously with the methods of composting and mulching. To sum up, this is a never-ending topic. If there are further questions in relation to this, I will gladly continue my answer. We wish you continued success with your gardening.